The Motorola MC68000 family of microprocessors is undoubtedly a revolu- tionary set of devices. The MC68000 is the first advanced 16-bit microprocessor with a 32-bit internal architecture and the first with 16-megabyte, nonsegment- ed, direct memory addressing. The processor's six basic addressing modes are equivalent to 14, when one considers all of the variations among these modes. Combined with… the device's data and instruction types, the modes provide more than 1000 useful instructions. 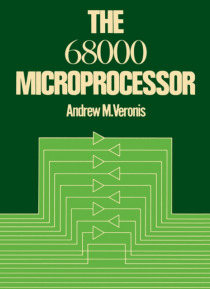 The book you are about to study has been developed as an aid to the hard- ware designer and as a supplement to the Motorola seminars on the 68000 microprocessor. The text includes a detailed description of the MC68000 and two complete systems that show how this processor can be interfaced to the outside world. The book follows a "e;top-down"e; approach. A brief history of microprocessors is provided first. Chapter 2 details the MC68000 by describing its registers, control lines, and capabilities. Chapter 3 introduces a small MC68000-based system. Although this system is characterized in the book as hypothetical, it is indeed the Educational Computer Board, used in the various Motorola seminars. The addressing modes and instructions are explained in Chapter 4, which includes helpful hints on how instructions can be used. Chapter 5 provides an in-depth description of additional instructions and numerous examples. Chapter 6 discusses exception handling and interrupts.